In 1900 Max Planck (1858-1947) combined the formulae of Wien and Rayleigh describing the distribution of energy as a function of wavelength of the radiation in a cavity at temperature T, to arrive at what is now known as Planck’s radiation curve. The point is that radiative high energy is NOT converted to some other kind of energy like heat IR unless the wavelength of the receiving body is in the absorption band. If it isn't, the photon is reflected and that is considered high albedo just like when a mirror reflects light without getting hot. I know this stuff is complicated but I found an interesting example in the photoelectric effect. A photon in the right absorption band of a PV panel knocks an electron away thereby generating current. BUT, that's no all that happens. A UV photon will hit and be emitted as two or more IR photons. I find that significant because if MORE UV is making it down here, there is a multiplier effect on IR photons because the emission is not one to one. Anyway, I'm just thinking out loud but the opening of the ozone hole matches the increase in temperature of the oceans and atmosphere in 1990 rather well. It doesn't explain the increased earthquakes or other solar system warming effects so I'll just file it all away for a while. Anyway, I'm just thinking out loud but the opening of the ozone hole matches the increase in temperature of the oceans and atmosphere in 1990 rather well. I followed your argument on the photons, as far as I could, but without some corresponding, profound change in the photon output of the sun, I don't see how it would contribute to the changes we see, measurably, unless perhaps the holes in the ozone and in the magnetosphere we have seen in that same time frame, have contributed. Could the weakening of the magnetosphere, as well as the ozone, be related to the weakening of the heliosphere? But that is sort of circular, in respect to photons, because if the heliosphere is weakening, as much as 25% in 50 years (which is astounding) wouldn't that mean the photon output is weakened as well? But then, they say the magnetosphere of both Mercury and Jupiter are expanding. Perhaps the cause of the the cause of the changes is coming from outside the heliosphere? But we have no satisfactory explanation as yet about the weakening of the heliosphere, at all. Suffice to say, the changes are multifaceted. Thanks for the . I can say the same about most everything I've seen from you. I'm working on translating your pieces. You have an expansive noggin. P-waves—The fastest waves, these compress or stretch the rock in their path through Earth, moving at about 4 mi (6.4 km) per second. S-waves—As they move through Earth, these waves shift the rock in their path up and down and side to side, moving at about 2 mi (3.2 km) per second. Rayleigh waves and Love waves—These two types of "surface waves" are named after seismologists. Moving at less than 2 mi (3.2 km) per second, they lag behind P-waves and S-waves but cause the most damage. Rayleigh waves cause the ground surface in their path to ripple with little waves. Love waves move in a zigzag along the ground and can wrench buildings from side to side. do not translate into IR photons because there are no absorption bands in the elements being shook violently (but extremely slowly compared with photon wave lengths) to receive them so these vibrations, in and of themselves, should not cause heat build up. However, conduction from undersea volcanoes would do so. The problem with that is that I looked it up (see my back and forth with RE) and the official word is that they are not adding appreciably to the oceanic heat load. 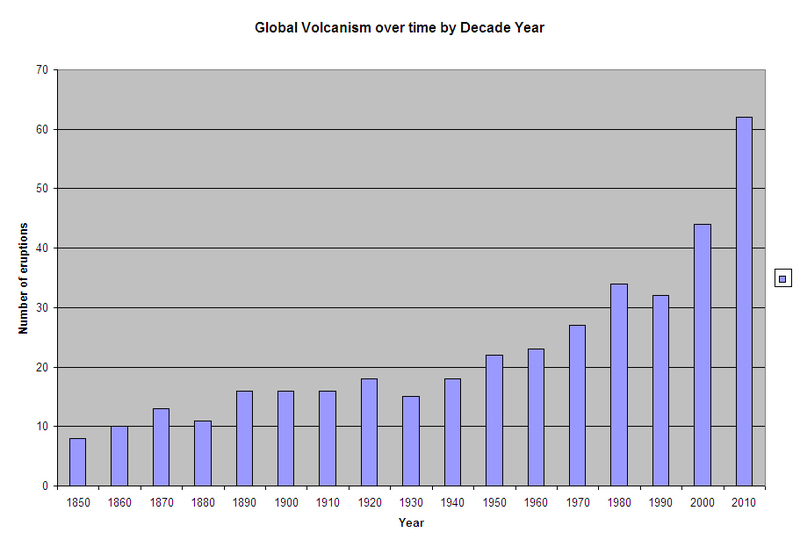 That's when I learned two thirds of terrestrial volcanoes are in the northern hemisphere. That heliosphere business is a real head scratcher. I frankly do not have any idea what sort of energy change that translates to. Is it some force outside compressing it and, in a conventional physics view, does that mean the heat inside the heliosphere has less space and is therefore providing more heat per cubic meter? That would fit the solar system warming scenario but who knows? As a kid, when I first saw a comparison of the size of the sun to the earth, I was gobsmacked that something could be that big. I asked my grade school scence teacher why it got colder when you went up if you were getting closer to the sun. When you talk of the heliosphere, I have a lot of trouble getting my head wrapped around the concept even though I have no difficulty picturing galaxies with millions of stars. It's a big neighborhood. Rapid increased warming in this region and throughout the globe has clearly left scientists scratching their heads for answers, but given the current political environment in the West and East, many scientists are reluctant to limit their research in areas that produced present day global warming theories. Not a whole lot of Data in this report, but some key points. First there is a longer trend warming cycle that started around 600 years ago, which predates the Industrial Revolution. Second, the Ice sheet breakups have been occuring mainly from the 1990s forward, precisely the time you see the increased earthquake activity increase in DLindquists graphs. Polar regions seem to be experiencing a FASTER warming trend than middle latitudes, but the mid latitudes are where most of the Industrialization and Greenhouse Gases get emitted. Why would the Poles Heat Up faster? I have an answer for this based on GOHTT, can anybody guess why the Poles are heating faster based on the theory? The "Scientists" are Scratching their Heads Balls here? Most people are unaware that the first sighting of the Antarctic Peninsula occurred in 1820, most likely during a Russian Imperial Navy expedition captained by Thaddeus von Bellinghausen. Since its discovery, the Peninsula has served the scientific community as a research platform toward gaining a better understanding of earth’s history and global climate change. This week a team of polar scientists from Britain, Australia and France published results of their work, adding a new dimension to our understanding of Antarctic Peninsula climate change and the likely causes of the break-up of its ice shelves. The first comprehensive reconstruction of a 15,000 year climate history from an ice core collected from James Ross Island in the Antarctic Peninsula region is reported this week in the journal Nature. The scientists reveal that the rapid warming of this region over the last 100 years has been unusual and came on top of a slower, natural climate warming that began around 600 years ago. These centuries of continual warming meant that by the time the unusual recent warming began, the Antarctic Peninsula ice shelves were already poised for the dramatic break-ups observed from the 1990’s onward. The Antarctic Peninsula is one of the fastest warming places on Earth, the average temperatures from meteorological stations near James Ross Island having risen by nearly 2°C in the past 50 years. Dr Mulvaney continues, “We know that something unusual is happening in the Antarctic Peninsula. To find out more, we mounted a scientific expedition to collect an ice core from James Ross Island — on the northernmost tip of the Peninsula. Within the 364m long core are layers of snow that fell every year for the last 50,000 years. Sophisticated chemical analysis — at BAS and the NERC Isotope Geosciences Laboratory (part of British Geological Survey) — was used to re-create a temperature record over this period. Though this research makes a significant contribution to the understanding of the role that Antarctica’s ice sheets play in influencing future climate and sea-level rise it presently does not answer why. Rapid increased warming in this region and throughout the globe has clearly left scientists scratching their heads for answers, but given the current political environment in the West and East, many scientists are reluctant to limit their research in areas that produced present day global warming theories. Looks like the Scientific Community is starting to look at this issue. It would be really good if they had a record of the heat dispersal below the Greenland Ice Sheet going back 20 years or so, but they probably did not have sensors down there then. My bet is if they did have sensors, they would show a steady increase in heat dispersal beneath the ice sheet. That would be consistent with the rest of the data. Could there be another of this type of volcano under the artic, still erratically active?? If so, it would explain the anomalous variance in artic sea ice melt. Perhaps there are several more worldwide? If so, that would give RE's theory a boost. Is anyone looking for them? The world's largest volcano lurks beneath the Pacific Ocean, researchers announced today (Sept. 5) in the journal Nature Geoscience. Becky was a science reporter at The Pasadena Star-News. She has freelanced for New Scientist and the American Institute of Physics and interned at Discovery News. She earned a master's degree in geology from Caltech, a bachelor's degree from Washington State University, and a graduate certificate in science writing from the University of California, Santa Cruz. To find out what her latest project is, you can follow Becky on Google+. Definite evidence the Earth Core is Heating Up! Quote: "There is no knowing if this will continue or was just a one off. It does show that gas is accumulating somewhere at depth and migrates to the lava lake as a big bubble where it bursts explosively sending volcanic bombs shooting above the lava lake and sometimes out onto the crater rim where people may be working." Well since I live SMACK DAB on the RING OF FIRE, maybe I will get to go out Pompeii Style! That is a classy exit to the Great Beyond! I've only skimmed a little of the various writings in here on "Geotectonic Ocean Heat Transfer Theory". But I did look up the name for the thing on search engines, and I can see that it is unique to RE of the DD, at least by this name. So it's premature to call it a theory. I'm willing to entertain the hypothesis as a legitimate scientific hypothesis. But we'd have to walk through it very soberly and examine some basic questions very carefully. If this hypothesis is strong and has much merit, why does the scientific community not discuss it? Or, if in fact it does discuss it, where? Because it is cross disciplinary. Also because too much is invested in the opposite theory that the atmosphere is warming the oceans, rather than the other way round.